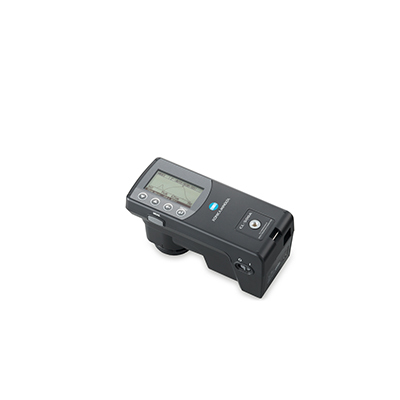 Konica Minolta introduced the CL-500A as its first lightweight, compact illuminance spectrophotometer. The device is designed to evaluate next generation lamps including EL illumination and LED illumination. The stand alone design and advanced sensors easily measure Color Rendering Index (CRI), chromaticity, color temperature, and illuminance of essentially every light source whether it is in the field or in the lab. The impressive, lightweight, compact, CL-500A Illuminance Spectrophotometer is used for illuminance measurements and the spectral evaluation of high quality, next generation lamps including OLEDs, LEDs, and EL illumination. The multiple sensors and optical grating make the CL-500A illuminance spectrophotometer ideal for measuring and evaluating CRI which is the calculation of color-rendering properties of light sources and lamps while providing objective criteria. This device will display and measure the CRI (Ra) and individual indices; R1 through R15. One of the many benefits of a sensor based detector is the capacity to present spectral distribution in graphic format. Since the CL-500A illuminance spectrophotometer is sensor based, using this instrument is a perfect option for measuring narrow bandwidth light sources such as Ultra High Pressure Lamps (UHP), LEDs, OLEDs, and many others. The immediate availability of photometric units makes them efficient on a moment’s notice; illuminance in lux and foot candle, chromaticity in XY and uv color space, Duv, color temperature (CCT) in Kelvin, dominate wavelength, tri-stimulus values XYZ, and excitation purity are among the viabilities included. The portable, light weight design encourages use with multiple applications throughout the lighting industry. 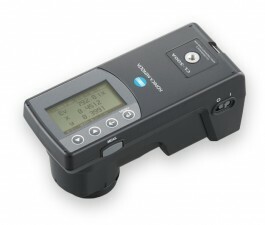 The CL-500A illuminance spectrophotometer can be used with or without a computer and has the capability of use by itself anytime color temperature lamps, LEDs, and/or CRI need to be measured. The ability to directly check peak wavelength and spectral irradiance waveform make this device a desirable addition to any kit. The CL-500A comes standard with the CL-S10w Data management Software capable of downloading directly into Excel. The device features a display that shows data such as spectral irradiance values, chart color rendering indices, spectral waveform, and enabled LED Binning Function. Two to ten CL-500A can be daisy-chained for multi-point measurements. Ability to measure CRI! Also measures and displays spectral distribution graph and peak wavelength in addition to illuminance, chromaticity, and color temperature. First compact, lightweight spectral irradiance meter in the world to conform to precise DIN and JIS standards. The CL-500A conforms to both DIN 5032 Part 7 Class-B and JIS C 1609-1:2006 General Class AA standards which ensure high accuracy illuminance measurements. Portable & Lightweight – Weighs in at only 350g or about 12oz! A high speed processor and integrated LCD screen provides the CL-500A the ability to function as a stand-alone instrument. The CL-500A also has an internal memory of 100 data points that may be downloaded and evaluated more thoroughly at a later time. Incudes Data Management Software CL-S10w – A convenient, easy to use Excel add-in software is included as a standard accessory for easy control of measurement procedures. High-speed measurement – Using the Software Development Kit (SDK) you can obtain measurements as fast as 5 times/sec. Instrument is suitable for production application. Automatic exposure time setting (high accuracy) mode: Approx. 0.5 to 27 sec. *1 For Section 7.6.3 Response Time, when measurement speed mode is set to FAST mode. *2 For 585.3 nm, evaluation performed using substitute wavelength of 587.5 nm. * For details on system requirements for above versions of Windows® and/or Excel®, refer to their respective specifications. All information provided herein, specifications and dimensions are subject to change without notice due to circumstances.